Is Douglas Dynamics' Higher Dividend Sustainable? The vehicle add-on specialist has boosted its payout; here's a look at whether it has the means to maintain it. It's tempting for a company on an upswing to share the good fortune by raising its dividend. That might be the dynamic at work for Douglas Dynamics (NYSE:PLOW), which lifted its quarterly distribution incrementally to just over $0.22 per share.That isn't a huge raise, but it's additional money out of pocket regardless. Let's take a look and see if the company can sustain that extra generosity. Douglas Dynamics' main stock in trade is vehicle add-ons and related equipment for activities such as snow plowing and salt/sand spreading. That was a good business to be in this past winter, with its plethora of blizzards and sub-freezing temperatures, particularly in the Northeastern U.S.
Not surprisingly, the company had an excellent Q4 and fiscal 2014. Its quarterly net sales were a touch over $100 million, an all-time record for the quarter, and a 37% increase over Q4 2013. Better yet, that line item for the entirety of 2014 was 56% above 2013's tally, landing at nearly $304 million. Net profit also grew as fast as a snowdrift in a blizzard. It advanced 53% in Q4 to $13 million, while for the fiscal year, it increased more than three-fold to $40 million from the 2013 bottom line of almost $12 million. Any company would feel flush after a quarter and year with those kinds of increases. And Douglas Dynamics isn't done yet; Q1 of this year saw much of the awful weather that characterized the 2014-2015 winter season. Fatter sales and profit figures are excellent, but as far as dividends are concerned, they don't tell the full story. What matters more is the amount of cash a company is taking in, and how this is utilized. Douglas Dynamics' Q4 -- since it was well in the black -- produced operating cash flow of nearly $72 million. The company's capital expenditures are typically low, and the quarter was no exception -- this line item came in at under $2 million. That results in a free cash flow figure of just under $70 million. Meanwhile, the new dividend will cost it something in the neighborhood of $5 million per quarter. So, for now, the company can easily afford the distribution. However, since its business is by nature largely seasonal, there are fallow periods where free cash flow drops -- or even falls into negative territory. Douglas Dynamics compensates for this by expanding or retiring debt. 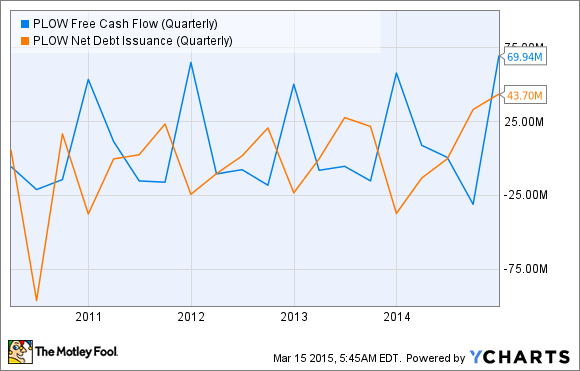 This takes on a general pattern -- the weaker the free cash flow, the higher the borrowings. PLOW Free Cash Flow (Quarterly) data by YCharts. This has the effect of keeping the company's cash and short-term investments line item comfortingly above water. Over the past five fiscal years, this hasn't dipped down much below $20 million, and at one point, it nearly reached $40 million. Meanwhile, Douglas Dynamics has managed to keep its interest expenses very steady, paying a bit over $8 million annually over the past three years. The enhanced dividend should cost the company less than $500,000 per year in additional interest expense. It should have very little impact, then, on its cash position, its level of indebtedness, or its interest expense. A dividend for all seasons? That effective cash management is one reason Douglas Dynamics has managed to not only to sustain its dividend, but to increase it gradually over the years. It initiated a distribution soon after its 2010 IPO, handing out just over $0.18 per share. The latest declaration represents a 22% improvement over that first payout. For a company operating in such a cyclical business, I feel that Douglas Dynamics has found a smart and balanced way to manage its money, adjusting cash on hand with borrowings as needed. Its dividend is well within its current means to pay, now and at least a few quarters into the future. And when the inevitable low seasons hit, the company will have no problem shoring up its finances with fresh borrowings.